Dr. Richard Ivry is Professor of Psychology and Professor of the Helen Wills Neuroscience Institute at the University of California, Berkeley. He received his B.A. in Psychology from Brown University, and he was awarded his M.S. and Ph.D. degrees in Psychology from the University of Oregon. Afterwards, he conducted postdoctoral research at the University of Oregon and Good Samaritan Hospital before accepting a faculty position at the University of California, Santa Barbara. Rich joined the faculty at the University of California, Berkeley in 1990. Over the course of his career, Rich has received numerous awards and honors, including being named a Fellow of the American Psychological Society as well as the Society of Experimental Psychologists. In addition, he was a recipient of the FIRST Award from the National Institutes of Health, an Alfred P. Sloan Research Fellowship, and the Association for Psychological Science Williams James Fellow Award for his lifetime intellectual contributions to the basic science of psychology. In our interview, Rich shares more about his life and science. When he’s not at work, Rich loves going hiking with his two dogs at a giant canyon near his home in the East Bay area in California. He also enjoys unwinding by hiking and surfing along the coast. Rich splits his time at work between teaching, service, and research. His research focuses on what makes certain individuals really good at skilled, coordinated movements. He also seeks to better understand what goes wrong in the nervous systems of people with neurological conditions that affect their ability to make skilled movements. Before college, Rich never really considered a career in science. However, he took a few psychology courses in college and really enjoyed these, particularly the lab classes where they got to do hands-on experiments. Rich chose to do a senior thesis project in a lab studying perceptual development in students from kindergarten through second grade. He was enamored with this year-long honors project. Coming up with his own ideas, being mentored by faculty, doing his own experiment, and forging his own path in science were exciting. By his last semester, Rich was only taking one formal course and was spending about fifty hours per week in the lab. After college, Rich accepted a position working in labor relations as a union organizer. He hadn’t thought much about graduate school, but after a year in the working world, Rich realized that going back to graduate school might be a good fit. He enrolled in the Cognitive Neuroscience program at the University of Oregon at the perfect time when there was a lot of phenomenal work being done and also many faculty members available to mentor students. Rich was very pleased with the first paper he wrote with one of his former postdoctoral fellows. Their results showed a cool effect, but they didn’t have a good explanation for this effect. They wrote a paper describing the effect and submitted it to a journal for publication. The editor replied that it was interesting, but that they needed to think more about how to interpret their results. After getting this initial rejection, Rich and his postdoc put their heads together and spent a lot of time brainstorming around the blackboard in the lab. Eventually, they came up with a new way to think about their data that led to the development of a concise and elegant model about how different parts of the brain use different error signals, and these different error signals can be a way to characterize the various learning systems in the brain and how they interact. When they re-submitted the revised version, it was accepted for publication, and it has gone on to be an influential paper in their field over the past seven years. Maintaining funding to support your research and your team is one of the most stressful parts of the job of an academic scientist. Recently, Rich has been successful in receiving grants, and this means that he can continue to support the people in his lab and doesn’t have to spend as much time writing more grants in the near future. Another exciting lab success has been a project on use-dependent learning, the process during which someone gets better at something by doing it over and over again, even without any feedback. A postdoc in Rich’s lab was following up on some classic experiments in this area, and he discovered a new way to think about what is happening in use-dependent learning. The postdoc ran new experiments in addition to collaborating with the author of the original studies to re-analyze the old data. It was thrilling to see that the postdoc’s new interpretations were relevant not just to the new experiments, but they also applied to the original data as well. Through his science, Rich has traveled to many places around the world. Some of the most memorable locations he visited were the three different places he has been on sabbatical. Each of these sabbaticals gave Rich an opportunity to feel like a graduate student again, with freedom to learn about new areas and explore new research opportunities. All three resulted in new collaborations with researchers around the world. In one sabbatical, Rich spent six months with his family in Marseille in the South of France. The school his children attended had half days on Wednesdays, so they made it a tradition to spend Wednesday afternoons exploring the surrounding French countryside. For another sabbatical, he lived with his family on Waiheke Island in New Zealand for six months. He had the most beautifully scenic commute every morning where he walked two miles through a vineyard to the ferry station, enjoyed the sunshine and ocean breeze while riding the ferry to Auckland, and then had a one mile walk up to the university. Rich’s third and most recent sabbatical was spent in New York City with his wife after his kids were grown. One of the most enjoyable parts of his time in New York was being able to commute often by bike from the Lower East Side up to Columbia University. It was a wonderful route where he saw a lot of the city and Central Park. Rich’s lab likes to go to escape rooms to see if they can master the puzzles together. So far, they haven’t been successful, but it’s still a lot of fun. In graduate school, Rich did a collaborative project with another graduate student that involved writing custom computer programs. On the old computers they were using, it took a long time for their programs to compile, so they developed ways to amuse themselves while waiting. One was Cog Lab golf. This involved kicking a tennis ball around a course they designed, and they became obsessed with it. It was entertaining, but they also had great discussions, and many new experiments were formulated during their games. The first day you enter graduate school, develop a system to track your references and the papers you’ve read. This will save you a lot of time and pain in the future. Also, you have to be proactive. If you are doing research with participants, you need to go where they are and make it convenient for them to participate. Finally, Rich doesn’t view his work as a job. He feels like a lifelong student fully immersed in the learning process with his lab and colleagues. This is a very gratifying and satisfying career. Rich’s research program explores various aspects of human performance with a focus on how people select, plan, and produce movement. The lab uses many of the methods of cognitive neuroscience including behavioral studies in healthy and neurologically impaired populations, TMS, fMRI, EEG, ECoG, and computational modeling. A current favorite project centers on how people acquire and refine motor skills, with a focus on the interaction of explicit and implicit learning mechanisms. Outside of work, Rich loves living in the San Francisco Bay area, trying to take advantage of the many recreational and cultural offerings. 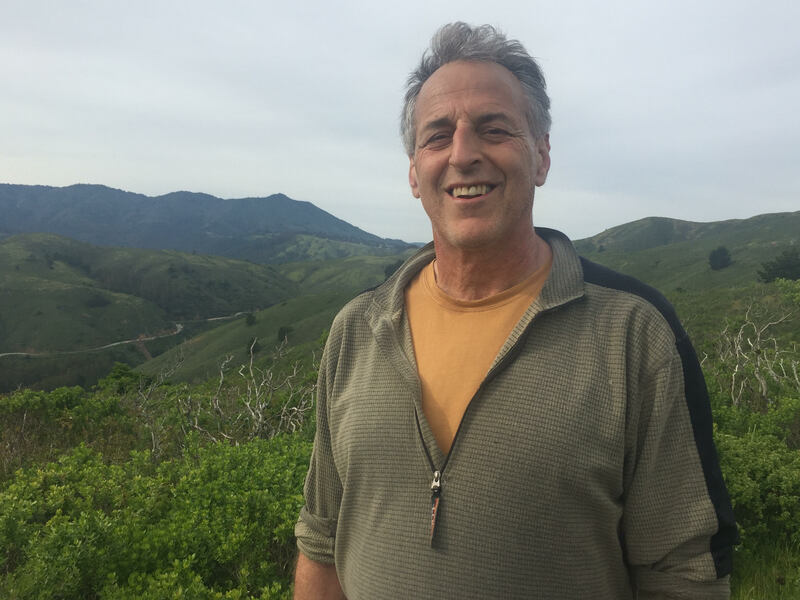 He spends a lot of time hiking with his wife and dogs in the hills behind Berkeley or along the coast, occasionally paddles out to try his hand at surfing, and has, what he calls, the world’s greatest commute on his bike with views of the Golden Gate bridge. Check out his youtube channel for a sample of his eclectic musical tastes.